A good friend and wonderful human being is no more. 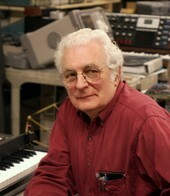 Bob Moog lost his battle with a brain tumor on August 21, 2005, at his home in Asheville, NC. He was surrounded by his family and died so gradually and peacefully you couldn't be more exact than to say it was around 2 PM. Bob and I were friends for about 41 years. That sounds incomprehensible now, but there you are. We met when I accidentally woke him up. He was taking a much needed nap on a banquette on the Mezzanine of the Barbizon-Plaza Hotel, in NYC. 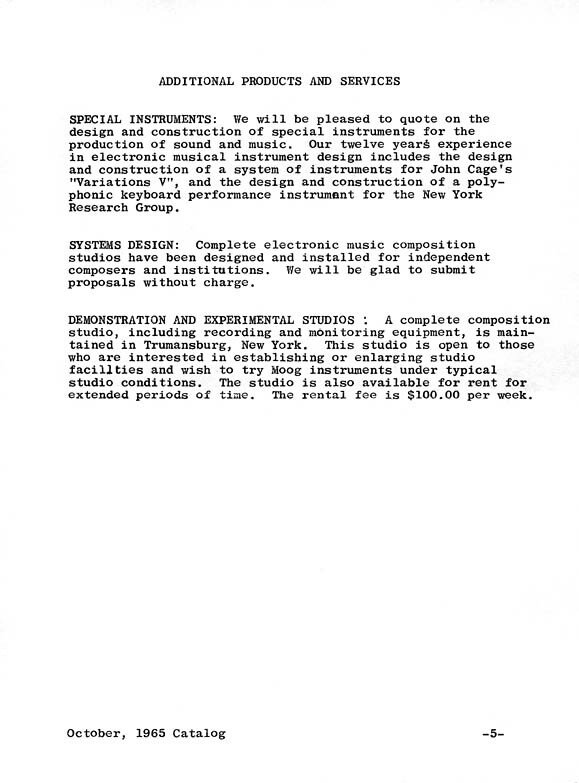 The Moog Company had setup an exhibit at one of the yearly AES conferences (the Audio Engineering Society was a LOT smaller back then, and more informal -- even the tech papers were free and handy, open to anyone attending the exhibits). This was my first AES show. One of my professors at Columbia, Vladimir Ussachevsky (who also knew Bob), had suggested that as one of his more technically curious graduate students I might enjoy wandering around the 1964 exhibit for a few hours. So I took a break between classes to subway down to midtown, and was gawking around during a slow early afternoon, when most people were off to lunch. There were mikes and consoles and tape machines of all sorts, all pretty impressive. Then I spotted a small booth that had something called "Moog Synthesizer Modules." 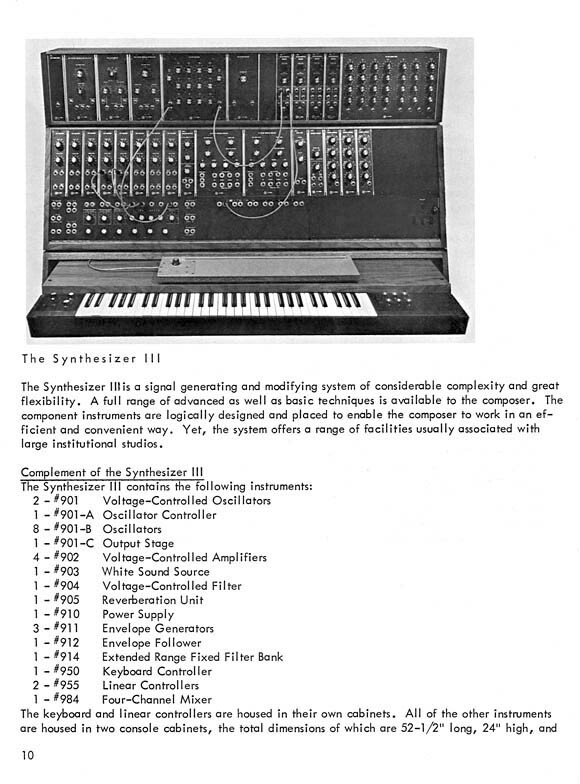 And sunuvvagun, there they were: voltage-controlled oscillators, filters, envelopers, controllers -- things the still primitive world of electroacoustic music long needed! I must have made noises, for suddenly I saw a figure stir and rise up to greet me. Bob looked tired but friendly, and we chatted briefly, traded phone numbers and addresses. It didn't take long to establish a budding friendship. It was a perfect fit: he was a creative engineer who spoke music: I was a musician who spoke science. It felt like a meeting of simpatico minds, like he were my older brother, perhaps. Soon I was to become one of his early customers, after composer Herb Deutsch, who was crucial to the development of the modules, Alwin Nikolai, an experimental dance guru, and Eric Siday, a composer and commercial music hero I befriended a couple of years later, thanks to Bob. 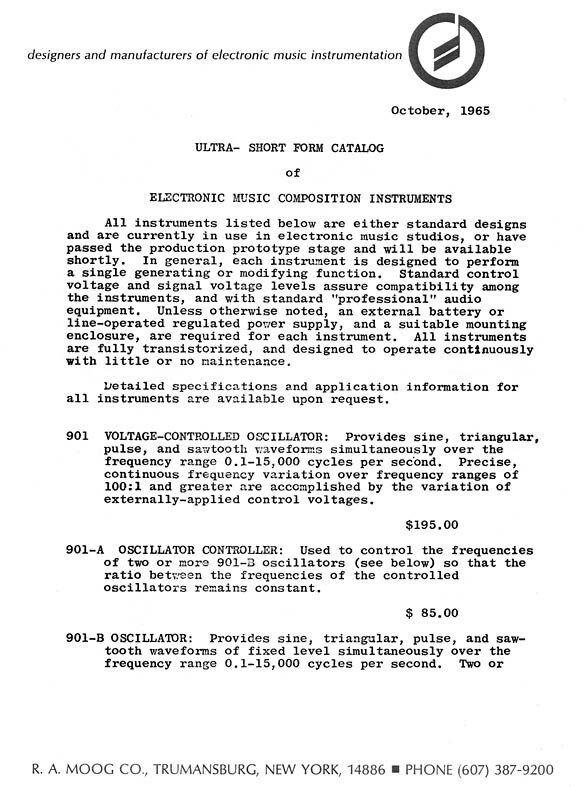 By early 1966 we were making plans for an initial custom instrument. Several chapters of a book can easily be inserted here to cover the years from 1966-68 (there's a lot of the story in the liner notes to most of the "Switched-On" albums, particularly the comprehensive booklet found in the "Switched-On Boxed Set"). In any event, we quickly worked out what was still missing and probably important (don't know for sure until you try...), allowing our ideas to jump back and forth, while zeroing in on what would permit genuinely "musical" electronic music to be made. Ever modest, Bob always deferred on musical matters to those of us who came from that side of the art/tech equation. We, on the other hand, deferred to Bob on all engineering decisions and designs. From the beginning it was a balanced yin/yang relationship between a maker of musical tools and the artists who used those tools. It doesn't seem to work that way much anymore, and more's the pity. Bob realized he needed an effective demonstration disk for his company's new customers. As a struggling young composer with few funds, I was able to "barter" my time and skills in recording, composing, and assembling a professional Moog demo LP, toward the purchase of additional synth components. Bob asked me to fly up to Trumansburg to work with him on the script, then I rushed back to assemble something for the Fall 1967 AES Convention. Fortunately I'd saved a lot of amusing brief "learning pieces" that Summer which came in handy to show off what these new instruments could do. It was an enjoyable project, part of a flurry of work completed in a few short, hectic years. At the end of the adventure, by the Spring of 1968, the first custom velocity and depth sensitive keyboards (something I was particularly involved with: physical construction, reworking, final adjusting) were kludged together. Actually EVERYthing Bob built always looked slick and professional, even the kludges. Finally an album you've probably heard of was about to become my "maiden voyage" with the synthesizer. Other key people became involved, such as my collaborator and producer, Rachel Elkind-Tourre, who was essential to the project. Rachel's the one who came up with the idea for a Bach album, and sold it to CBS Records. The title: "Switched-On Bach," that was CBS's suggestion, and a good one, snappier and more memorable than ours ("The Electronic Bach"). Through the years since, Bob and I remained in touch, and visited each other often. He was at Digital Keyboards when the pioneering additive/complex modulation synth I've used a lot, the "Synergy", was developed, based on Hal Allis' designs. He was at Kurzweil when I began using their great sounding instruments, finding ways to combine the benefits of "sampling" with the important expressive sound design features of earlier synthesizers, part of what Kurzweil called "VAST." And eventually, he setup Big Briar, in his new hometown of Asheville, NC. It was a kick for Bob to regain legal use of his own name for his company more recently (wotta concept! ), and he actively participated as the electroacoustic field matured and eventually became taken for granted. A true mark of success, that. I loved the perfectly apt image he took on during his last ten years, sort of a benevolent, wise old Swiss Watchmaker. Those knowing hands of his were always a pleasure to see in action. Bob was the consummate toolmaker. He did it better than anyone else, combining art with technology. Bob was in it for all his life, starting as a teenager building Theremins, to new devices for Raymond Scott, to the synthesizer developments of the past four decades. I'd just written him a long "ketchup" letter, as we frequently did, and thanked him for the generous, charming commentary he wrote for SEAMUS, when they presented me with their Life Achievement Award in April. His message the next morning: he was really glad to hear from me, BUT. He was about to go for a second opinion, because he'd just been diagnosed with some kind of brain tumor. Horrible news, just horrible. While I sent him several short notes during the treatment: radiation, chemo, Bob never was to write again (he was the rare engineer who actually wrote beautifully, BTW). I checked around the Web for more information on him from the past couple of years while we'd been out of touch. There I discovered that up at the top of his all time favorite albums was my "Beauty in the Beast." Damn. Never knew that before. It had nothing to do with his instruments, but he must have recognized the impetus which drove me to compose that album (I consider it my most important work, you see). Another connection, but too late to thank him. Two days later the word came from Ileana. It was all over. Fortunately many of us were able to get down to see the family again, be there with them for the funeral and Memorial Gathering the day after. They asked me to speak, too, and play a few excerpts of my music. It was hard to find the proper words, so I just let it flow out honestly, then introduced the selections. I don't recall everything I said, but it was close to what's written here, a story about an intelligent, modest, and lovable man, who helped us define a new medium. I don't know how I'd have been able to start my career if Bob had not been there. And I'll never forget him. We're all now left to carry one, as the baton is passed in turn to each of us. I ended my comments in the dark hall that afternoon with a brief story by SF author, Jerry Pournelle. When he was a young beginning author somehow he managed an introduction to one of the great SF writers of the 20th Century -- Robert Heinlein. Soon he received a rare invitation: to stop by the master's house for a visit. The hour passed too swiftly. He floated through it in a glow, thinking just how fortunate he was, learning bits of history, some pithy writing tips from one of the best. And then it was over, and he hastened to say goodbye and leave. Pournelle recalls making his way to the door with a gushy: "Gosh--thank you so much, Mr. Heinlein, I don't know how I can ever pay you back!" The old man's retort was quick and to the point: "You can't! You pay forward!" And so it is now with us. 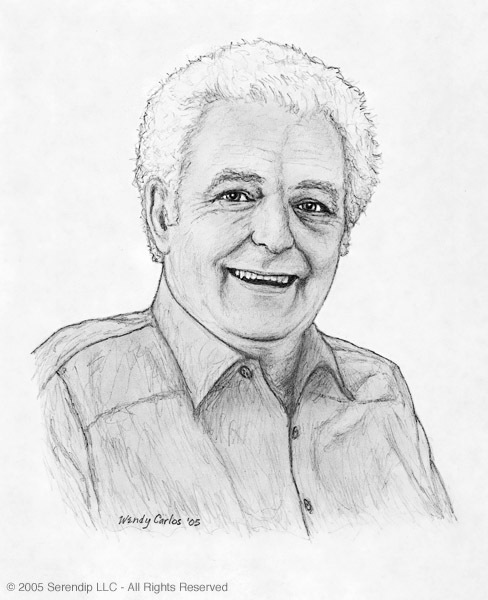 Note: Whenever I've lost someone dear to me it has generally felt right and proper to create a pencil sketch of them to add to the website, and have "floating around in the Ether" of the Internet. The drawing at the top of this page is one I made just after receiving word from Ileana that her husband's condition was very grave. Four days later we learned that it was over. In some haste I added the sketch with Bob's dates to the Index Page, as a placeholder for this new page, which now supplants that temporary addition. The narrative above is based on my mostly extemporaneous talk that afternoon in in Asheville, NC. Many mutual friends and family members (some had flown in great distances) spoke with both humorous and also very moving stories, while others performed music on his instruments. Bob's son, Matthew, made an effective MC. It was an ideal way to celebrate the life and work of someone we had known so well and now would miss. Later everyone agreed that Bob would have really enjoyed the day: his kind of informal, spirited, friendly gathering. 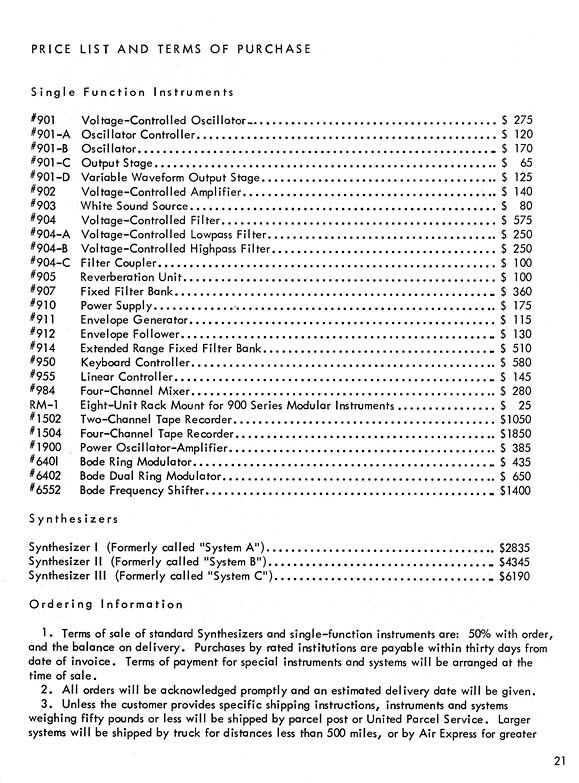 This is the top page (there was no cover) of the original 1965 Moog Catalog. It was on regular bond paper, all held together by a staple in the upper left-hand corner. Nothing fancy back then, it was the preliminary information that was of interest. In this case, after a brief overview, we delve immediately into the voltage-controlled oscillator modules. HERE is page two of the 1965 Catalog. 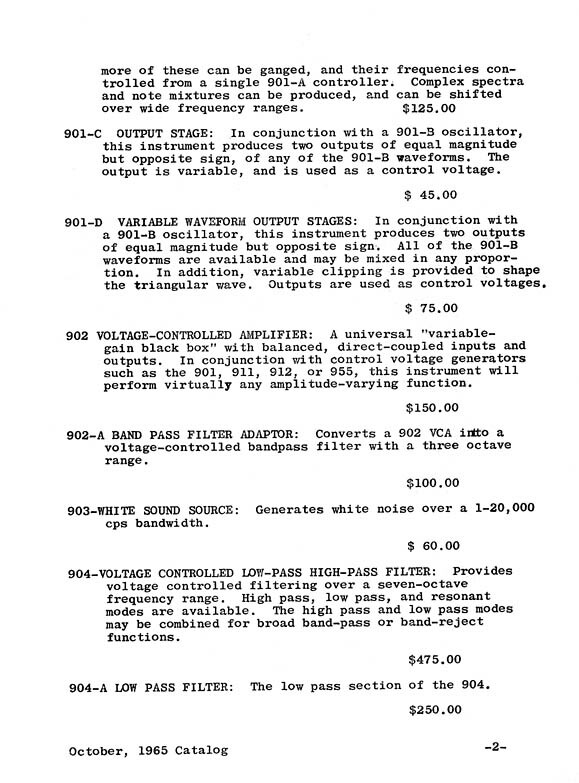 This page continues with the oscillator modules, including special output stages, then on to voltage controlled amplifiers, a special white-noise source, and the particularly crucial (and famous -- it's also Bob's main patent from the time) voltage-controlled filters. 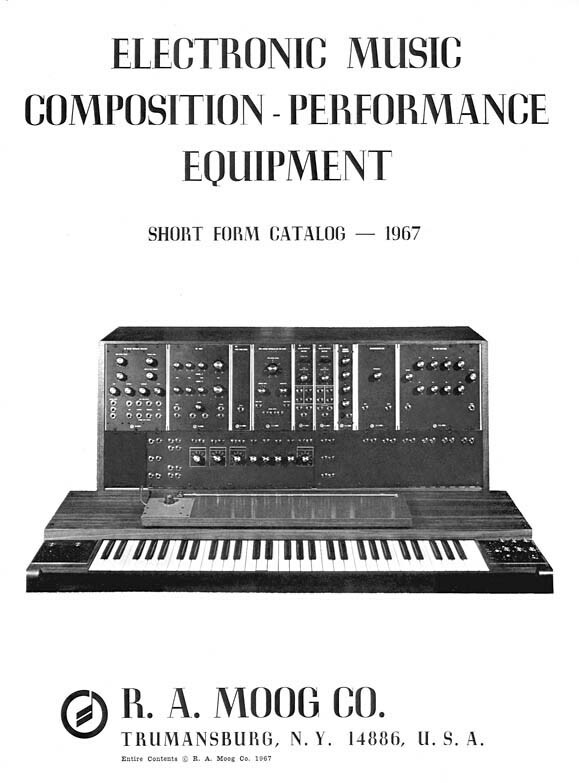 This is the front of the 1967 Moog Catalog. The catalog had a bold, attractive physical cover, printed on a bristol-board heavyweight stock, slightly oversized from the standard-sized pages within. Everything was saddle-stiched together, a very trim and neat package. HERE is page ten of the 1967 Catalog. It features the larger Moog III instrument, which was approximately the size of my instrument at the same time, although with fewer of the idiosyncracies I preferred. 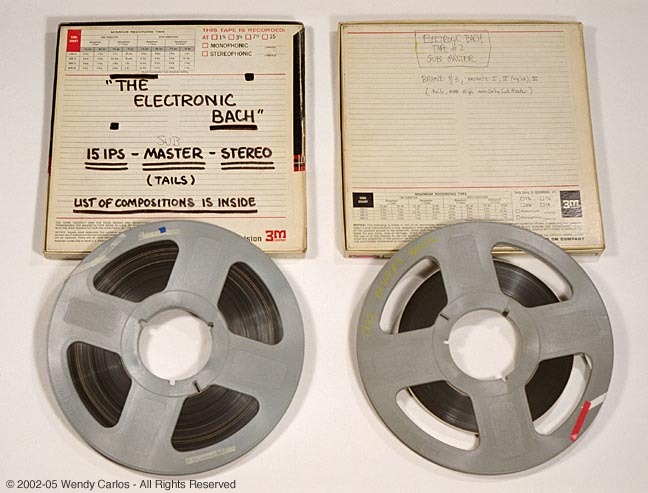 These are the two track submaster tapes (note that "sub" was added later), which were then copied and equalized, and had their amplitudes manually readjusted to maintain consistent levels from track to track, and within tracks which contained spliced together "takes." All of the LP masters, the early reel-to-reel, 8-track, and later cassette masters, and eventually all CDs that CBS/Sony released, were taken from those tweaked copy "final master" tapes. Unfortunately the extra dubbing also added an additional generation of tape noise and distortion. But that's how the professionals did it in those days. For the new ESD special editions, however, I returned to the tapes you see here, carefully stored all these years. These had been mixed directly from the 8-track multitracks = only two tape generations. Most of the EQ alterations for LPs were no longer needed, but the levels were now all over the place. So I duplicated those earlier gain changes we'd done in step three, but now within the 20-bit digital domain, and added some important other tweaks. You can hear how much more transparent the sound is, how much truer to Bob's synthesizers the results, to compare the new CDs to any prior version. Please note: EVERY copy of Switched-On Bach originally came from these two reels you see above, which is why I thought they belonged here as another important document from that time. Download the file to read and/or print HERE. If your browser has problems download a zip version HERE. Included in our new pdf section are two interviews written by Bob Moog for Keyboard Magazine in the fall of 1982, shortly after Disney's TRON appeared, my filmscore for it being the point of departure for the interviews. You can also access these articles by clicking the appropriate image or link in the double box below. "Secrets Behind the Soundtrack of TRON"